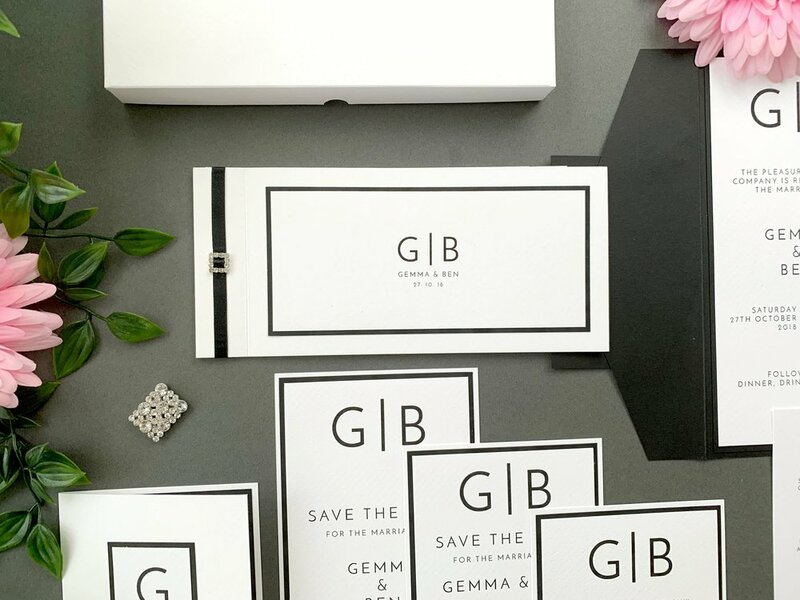 Our Clio wedding invitation is perhaps our most unique being the only collection that comes in a slim DL format, and with one of the day invitation options taking the form of a stylish chequebook. Colour comes from a choice of ribbon colours, plus matting layer for cardstock. What’s a really neat touch for the chequebook is that the RSVP slip is detachable for your guests to tear out and return to you using the supplied envelope. Invitations are available either as a chequebook, folded or pocketfold suite for day guests and simple matching evening invitations too. We exclusively use Berisford and Satab ribbons for their vibrancy and non-fraying quality and use 6-7mm ribbon for Clio - shown here in “Black”. Click below to see the colour options that are currently available. Clio uses coloured cardstock sparingly, for the matting of the central panel on the chequebook and for an additional layer to some other items, shown in “Black” in the pictured examples. Click below to see the options that are currently available. We also offer some additional printing options to make things even easier for you and / or your guests. Our Clio collection uses layers of Italian textured cardstock alongside coloured cardstock and satin ribbon. Envelopes provided as standard with invitations and RSVP cards. All of our Invitations include a proofing process where pdf files are created and sent by email for review; this proofing process includes colouring in addition to wording. Two further rounds are included as standard.